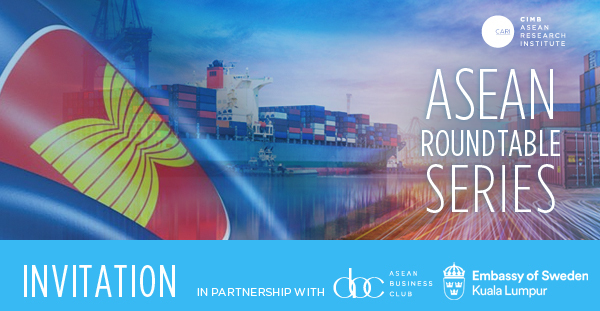 ASEAN Roundtable Series in partnership with the Embassy of Sweden in Malaysia: How does ASEAN navigate the new trade [dis]order? Home / ASEAN Roundtable Series in partnership with the Embassy of Sweden in Malaysia: How does ASEAN navigate the new trade [dis]order? TOPIC: ASEAN Roundtable Series in partnership with the Embassy of Sweden in Malaysia: How does ASEAN navigate the new trade [dis]order? ASEAN sits in the India-ASEAN-China corridor which has been dubbed as the ‘golden arc of opportunity’ due to the projected rise in upper and middle-income classes in the next two decades.1 However, due to the region’s reliance on world trade, ASEAN is vulnerable to the new world trade order that is characterised by rising protectionism, nationalism and trade tension. With regards to the US-China trade tension, the two countries are in the midst of negotiating a trade deal that would lower Chinese tariffs on a list of US goods if the US removes its range of sanctions against Beijing.5 But until a deal has been finalised, the uncertainty in the market will linger. Besides the trade tension, various global trade dynamics continue to pose significant uncertainty on ASEAN’s growth trajectory. China’s Belt and Road Initiative (BRI) continues to dominate ASEAN Member States’ domestic political-economic discourse, while the Brexit impasse continues to loom over the European markets thereby posing potential economic repercussions around the world. Although the UK only makes up 1.5% of ASEAN exports in 2015, ASEAN’s trade with the EU stood at 13% in 2014. An economic slump in the EU caused by the Brexit would pose a significant challenge to ASEAN.6 Meanwhile, ASEAN’s trade with India has moderated since 2008,7 despite the potential economic benefits from increased trade between the two. As one of the top ten global trading powerhouse, how can ASEAN navigate the geopolitical dynamics in of the new world trade order, or “disorder”? How should ASEAN balance its regional priorities between the west and the east? 1 East Asia Forum, Time for bolder steps from ASEAN, February 24, 2019. 2 UOB, ASEAN Snapshot – Special Coverage On Tourism, May 2018. 3 Reuters, WTO warns of global trade slowdown as indicator hits nine-year low, February 19, 2019. 4 Nikkei Asian Review, Emerging Asia bears brunt of global trade slowdown, March 3, 2019. 5 Wall Street Journal, U.S., China Close In on Trade Deal, March 3, 2019. 6 New Straits Times, Brexit’s impact on ASEAN, April 17, 2017. 7 ISEAS Yusof Ishak Institute, ASEAN-India Economic Relations: Low Base, Large Potential, October 30, 2018. Niklas Johansson is the Deputy Minister for Foreign Trade and the State Secretary to the Minister for Foreign Trade, with responsibility for Nordic Affairs, Ann Linde. Johansson has a Bachelor of Science in Business Administration and Economics from Stockholm School of Economics. Prior to his current position, he was previously the State Secretary to Minister for Enterprise and Innovation Mikael Damberg from 2016 to 2018. Johansson has ten years of experience as political adviser to ministers in the Swedish government. From 2003 to 2006, he worked at the Prime Minister’s office as the political adviser to Prime Minister Göran Persson. Prior to that, he served as political adviser to Leif Pagrotsky, under several government portfolios, from 1997 to 2003. In 1996, Johansson was the political adviser to Björn von Sydow, Ministry of Industry and Commerce. Aside from his political career, Johansson is an experienced businessman. He served as the Chair of the Board of Directors of Friends Agenda AB, a business development and branding agency, from 2012 to 2016. He was the Deputy Chair of Fujian Opcon Energy Technology Co., Ltd, China, a screw expanding power generator manufacturer, from 2014 to 2016. He served as Board Member of Opcon Compressor Technology AB, Svenska Rotor Maskiner AB, Opcon Energy System AB (OES), which develops technology for the generation of electricity from waste heat and from 2007 and 2016, Johansson was the Deputy CEO at Trention AB, formerly Opcon. Mr Ng was elected as the Member of Parliament for Batu Constituency in 1999 to 2008. He served in the Malaysian Government as Deputy Minister of Ministry of International Trade and Industry (MITI) (2006-2008) and Parliamentary Secretary of Ministry of Plantation Industries & Commodities (2004-2006). He also was the Chairman of Malaysian Logistics Council as well as Chairman of Federation of ASEAN Shippers Council. He served as Chairman/Director of Malaysian Futures Clearing Corporation and Deputy Chairman/Director of Kuala Lumpur Commodity Exchange. He has an extensive experience and is well known in the Malaysian corporate world. He had been the Group Editor of the New Straits Times, first executive chairman of CIMB and founding chairman of the Malaysian Securities Commission. After stepping down from the Securities Commission in 1999, he became Independent Non-Executive Director of Telekom Malaysia Berhad, Chairman of Celcom (Malaysia) Berhad and Non-Executive Chairman of Malaysian Airline System Berhad. He was Founder President of the Kuala Lumpur Business Club, established in 2003 and is a member of the Court of Fellows of the Malaysian Institute of Management. Tan Sri Dr. Munir obtained a B.Sc (Econ) and Ph.D in International Relations from the London School of Economic and Political Science (LSE) in 1971 and 1978. He is an Honorary Fellow of LSE and continues the long association with his alma mater as Visiting Senior Fellow at LSE IDEAS (Centre of International Affairs, Diplomacy and Strategy). Tan Sri Dr. Munir is an associate of Southeast Asia Centre (SEAC) at LSE.